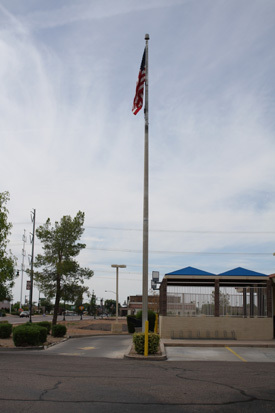 If you’re searching for flag poles for sale, flat pole service, flag pole installation or flag pole repair in Phoenix, Western Signs & Lighting can help! 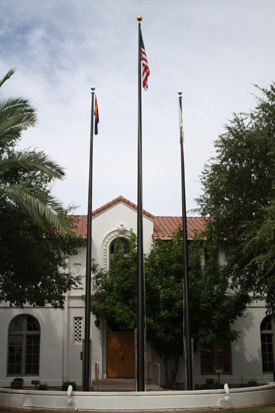 We offer commercial flag pole repair and installation services throughout the entire Phoenix Metropolitan area including Phoenix, Scottsdale, Paradise Valley, Gilbert, Mesa, Chandler and more. Flag poles are a wonderful way to clearly express your love of our country and/or state. Flag poles are also an excellent way of making your business stand out from the crowd. Our staff is well versed in the various city codes that govern the size and placement of flag poles. We will apply for and obtain city permits as required by local code. We ensure that your sign project follows all of the necessary guidelines for displaying the American flag overnight with flagpole lighting. If you already have a flagpole, we have the expertise and equipment to service it. 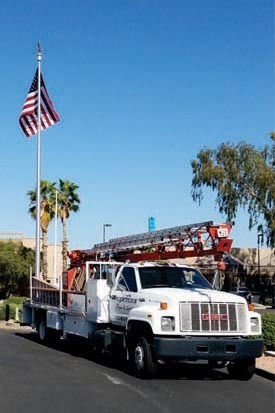 Popular search queries used to find our flag pole services include: Commercial flagpole installation, commercial flagpoles for sale, flagpole installation, flagpole repair, flag pole service, flagpole installation companies, flagpole installation near me and flagpole maintenance in Phoenix. With the right maintenance and repair, your flag pole will stay looking beautiful for years to come. At Western Signs & Lighting, we are proud to offer flag pole repair and part replacement. Why Install A Commercial Flag Pole? Flag are the perfect way for your company to display pride for your country and armed services. Although, without a flag pole, your flag won’t get all of the attention it deserves. Install a flag pole on the exterior area of your business to get the full effect. Western Signs & Lighting provides flag pole installation for government and commercial properties. Our commercial flag poles are available steel, stainless steel, fiberglass and aluminum and range in size from from 20-130 ft’. The diameter and wall thickness can be customized for wind resistance requirements. We use a concrete base as the foundation for your flag pole installation. The concrete base increases as the diameter and height of the pole is increased. Usually, the base is 4 times the flag pole’s diameter and 10% of its height. 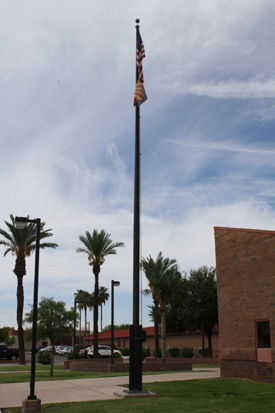 Receive a free commercial flag pole installation quote by giving Western Signs & Lighting a call today at 480-831-8600. If you're searching for flag poles for sale, flag pole installation or flag pole repair in Phoenix, Western Signs & Lighting can help!